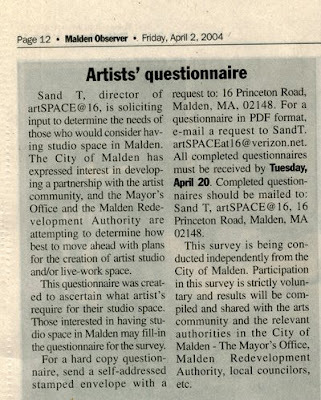 This survey was initiated, written and conducted by Sand T/artSPACE@16 independently from the City of Malden. The purpose of compiling the results of this survey is to consolidate the voices of artists concerning their unmet spatial needs for studio space in Malden. Artists' participation in this survey was strictly voluntary, and results were compiled and shared with the arts community and the relevant authorities in the City of Malden to better understand artists space needs while pursuing the creation of artists studio space in Malden. Together with the REPORT, all completed questionnaire and comments sheets provided by artists/respondents' were delivered to the City and State Representative Christopher Fallon by Certified Mail on May 11, 2004. My involvement in this collaborative included but not limited to art studio study and reaching, put together questionnaire, organizing, planning, identify artists, web page design, community outreach, conduct the survey, write report. I also financed, designed the production of this report. I sincerely thank three other Malden residents, Wesley Kalloch, Paul Knapton and Julia Unggai who have contributed their voluntary helps in proof reading, constructive suggestions and web technical assistance in making this INITIAL SURVEY FOR ARTIST STUDIO SPACE IN MALDEN possible.